Greig had arranged his fleet of seventeen battleships in the usual three squadrons under Rear- Admiral M. Yon Dessen, himself, and Rear-Admiral Koslanianov. On July 9th the fleet left Krasna Gorka, in the evening of the 14th it approached the island of Hogland, and in the morning of the 17th it sighted the Swedes north-west of that island. 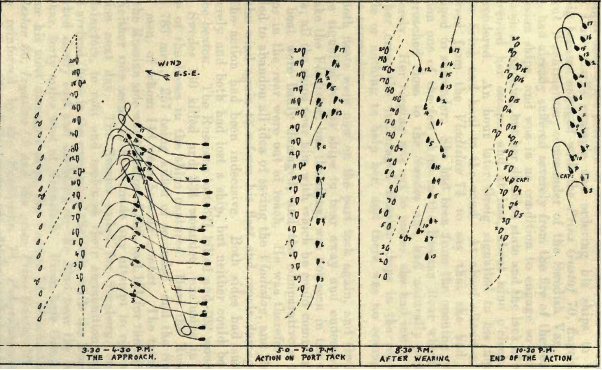 The wind was E.S.E., a light breeze, and the Russians to windward in a close-hauled line on the starboard tack, while the Swedes were on the port tack in a bow and quarter line, thus having the general direction of their line parallel to that of the Russians. At about 11 a.m., as the Russians finished forming their line, Duke Carl also put his fleet on the starboard tack by making them tack together. At 1.30 p.m. he reformed his line on the port tack in the natural order, it having been up to now in reversed order. About 2.30 the Swedish fleet tacked together to a bow and quarter line on the starboard tack, and a little before 4 o'clock it tacked together again and formed close-hauled line on the port tack. Meanwhile the Russian fleet had been gradually coming down before the wind more or less on the starboard tack, and now, wearing simultaneously to the port tack, it bore away towards the Swedish line. At the moment of contact the Swedish fleet was in excellent order, and the Russians quite the reverse. At 3.30, as he came down with the wind on the starboard quarter, Greig had signalled to the rear squadron, then leading the line, to bear away for the enemy's van. Unfortunately this order was also carried out by three other ships, the Boleslav, Metcheslav, and Vladislav, and though Greig shortly signalled to the whole fleet to bear away, these ships had quite lost their position in the line. Further, on his signalling at four o'clock to the fleet to wear to the port tack, three other ships the Bogoslov, Pamyat Evstafia, and Deris tacked instead, and thus got to windward of the line away from the enemy. As a result the Russian fleet went into action not in the line of battle as arranged, but somewhat as follows: Vseslav 74, Vysheslav 66,Rodislav 66, Sv. Elena 74, Sv. Petr 74, Mstislav 74, Rostislav 100 (ahead of line), Izyaslav 66, Boleslav 66 (ahead of line), Viktor 66, Yaroslav 74 (behind line), Metcheslav 66 (ahead of line), Kir loann 74, loann Bogoslov 74 (behind line), Vladislav 74 (ahead of line), Pamyat Evstafia 66, Deris 66 (behind line). True to precedent, Greig, in the Rostislav, attacked the Swedish flagship Gustaf III. and her next astern, the Fadernesland. This left ten Swedes for the seven Russian ships ahead of the flagship, but as three of the Swedes were frigates the odds were pretty even. In the rear the Russians did badly. Greig's next astern, the Izyaslav, attacked the Ara and Minerva, but the six following Swedes were able to concentrate on the Boleslav, Metcheslav, and Vladislav, since the rest of the Russians kept deliberately at long range. At length the fire of the leading Russian ships overcame that of the lighter Swedish vessels, and these gradually bore away. There was an almost complete calm, and all movements were difficult; but at last, at about eight o'clock, Duke Carl wore his fleet to the starboard tack and reformed his line. Mean- while Greig, in the Rostislav, finding it difficult to keep astern of the Mstislav and Sv. Petr, had luffed up, passed to windward of them, and come into action ahead of them. This brought him to the position of fifth in the line, and on following Duke Carl's example and ordering his ships to wear, Greig became engaged with the Prins Gustaf 70, flagship of Count Wachtmeister, commander of the Swedish Van. This ship had already suffered severely from the fire of the leading Russian ships, and was in no condition to engage so formidable an antagonist, but her disabled state and the lack of wind prevented her escape, and at last, about nine o'clock, she surrendered. An hour later Greig signalled to his fleet to cease firing and haul to the wind. At about eleven a boat arrived from the Vladislav 74 to say that she had been obliged to surrender. She had been from the opening of the action one of the few ships in the Russian Rear which had approached close to the Swedes and had naturally suffered severely. Her rigging was cut to pieces, she had lost a third of her crew, the undamaged Russian ships in the rear did little or nothing to help her, and there was no course left save surrender. Both fleets were now on the port tack again, and Greig at once signalled to his ships to bear away and endeavour to retake the Vladislav, but the signal was not seen in the darkness; all the ships near him with which he could communicate by boat were badly damaged, and the comparatively fresh ships in the rear were out of reach. He was therefore compelled to abandon all idea of saving the Vladislav, and hauled to the wind again to reform his fleet and repair damages. The action had been indecisive. Both sides had suffered severely and both had lost a ship, but neither could be said to be beaten. The Russians lost 321 killed and 702 wounded, the Swedes 130 killed and 334 wounded, exclusive in each case of the losses in the ships captured. Here the Russians lost 783 men,* 257 being killed or wounded, and the Swedes '687 men, of whom 148 were hors de combat. The total loss on the Russian side was therefore 1,806, to 1,151 for the Swedes.